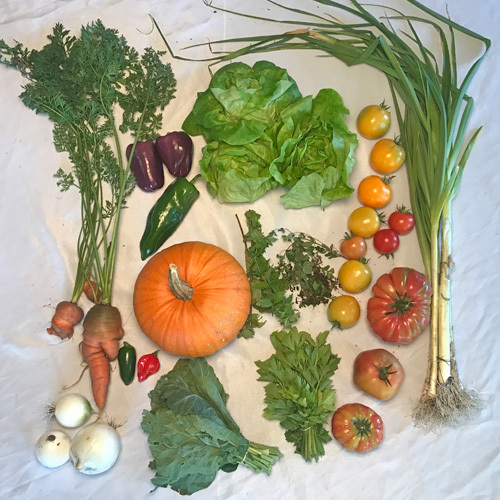 Thanks to this wonderful weather the garden is still providing lots of great produce. 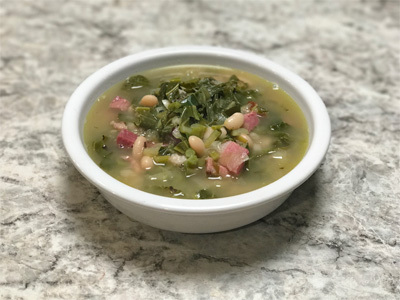 With some rainy days up ahead we have a great ham bean and collard soup recipe, as well as chicken pot pie that will warm you up. We hope you enjoy cooking these great fall recipes! Boil 1 cup of sorghum grain in 2 cups of water for 25 minutes, or until tender. Other grains can be substituted, such as quinoa, rice, couscous, or barley. Dice 2 beefsteak tomatoes and 3 cocktail tomatoes. Finely chop 2 tbsp of mint, and dice 1 small white onion. 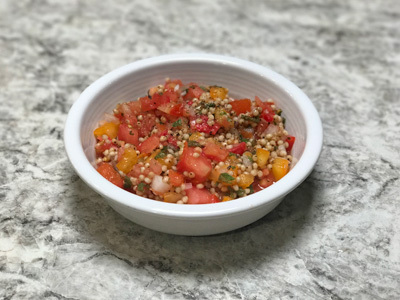 Combine tomatoes, mint, and onion in a bowl with 1/4 cup olive oil, the juice of 1/2 lemon (about 2 tbsp), 1/2 tsp of salt, and ground pepper to taste. Allow 20 minutes for flavors to marinate, then serve. Slice sugar pumpkin down the center and scoop out the seeds. Place on greased cooking pan face up. Halve 4 cocktail tomatoes and place in pumpkin cavity. Coat tomatoes and pumpkin with cooking oil. Sprinkle 1 tsp of salt over tomatoes. Roast for 30-60 minutes, or until pumpkin is easily pierced. Remove from oven and when cool enough to handle, puree all tomatoes and 2 cups of roasted pumpkin together. Saute 1/2 diced white onion in 1 tbsp olive oil for about 10 minutes. Add 1 clove of garlic, and saute until fragrant. Add the tomato-pumpkin puree and 1/4 cup of water, 1 tsp salt, 3/4 tsp ground cinnamon, 4 tbsp maple syrup. bring the sauce to a boil, then lower the heat and add 1/2 cup coconut milk, 1 tsp minced summer savory, and 1 tsp minced oragano. 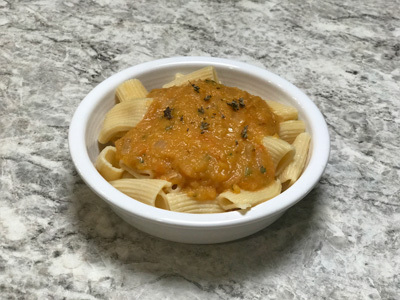 Serve over your favorite pasta. Cook 1 cup of presoaked white beans (such as northern beans) for 40-60 minutes, or until tender. In a large saucepan heat 2 tbsp of olive oil over medium high heat and add 1 large diced white onion, 1/2 bunch leeks. Cook for 5-10 minutes, or until onion is translucent. Add 2 cloves of crushed and diced garlic and continue to cook for several minutes. Add 1/2 bunch of celery greens, finely chopped (about 1/2 cup), 2 diced sweet peppers, and 1 diced jalapeno pepper. Saute celery and peppers with onions and garlic until tender. Chop collard greens into thin ribbons, and finely chop collard green stems (optional). Add greens and stems to the sauteed vegetables. Add cooked beans, 3 cups of water and 1 cup of diced ham. Add 2 bay leaves, 1 tbsp of salt, and 1/2 tsp of pepper. Bring soup to a boil, then reduce heat and cook for 5-10 minutes. We made ours with a lard crust but feel free to use whatever crust you like. 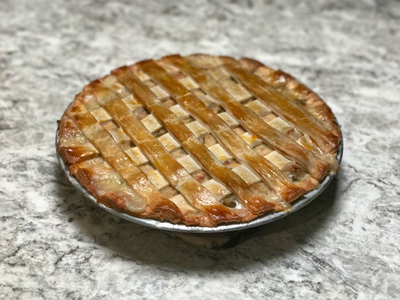 Crust: in a large bowl combine 2 cups of flour, 1 tsp salt, and 2/3 cup lard. Mix until mixture resembles sand. add 5 Tbsp ice water and mix until everything starts to come together. form in two balls wrap in cellophane and refrigerate for at least an hour. Pie Filling: Heat 2 tablespoons of cooking oil over medium heat. Add 1 clove of minced garlic, 1/2 finally minced onion, and 1/2 cup chopped mushrooms. Cook for two minutes or until onions are translucent. Add One whole bunch chopped carrots, One potato diced, 1/2 bunch of celery, and one diced bell pepper. Cook for one minute. Add 2 cups chicken broth and simmer until vegetables are soft. Add 1 cup shredded cooked chicken, 2/3 cup milk, and 1/3 cup flour stir and simmer until thickened. 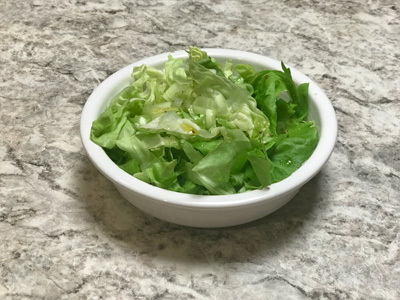 Chop 1 head of bibb lettuce into 1/2 inch ribbons. Add 2 tbsp of finely chopped leeks. Top with lemon vinaigrette: juice of 1/2 lemon, 3 tbsp of olive oil, 1/2 tsp salt, and pepper to taste.